The 50-MW Kumeyaay Wind Project, located on Tecate Ridge about 60 miles east of San Diego, California, is the largest wind-energy project on tribal land. There is enormous untapped wind power potential on Native American tribal reservations, and a number of groups-including Native-owned NativeEnergy LLC-are working to overcome some of the challenges to develop this power. By some estimates, the northern Great Plains has the potential to produce up to a staggering 300 gigawatts of wind-generated electricity. But much of the land with the greatest wind energy potential is part of Native American tribal reservations, and therein lies many of the challenges to develop the power, proponents say. With their sovereign nation status, tribes cannot take advantage of federal renewable energy production tax credits, and they frequently have difficulty obtaining conventional financing. A handful of groups, including NativeEnergy LLC, a privately held Native American energy company, of Charlotte, Vermont, and Native American tribes themselves, are trying to overcome some of those hurdles with upfront sales of renewable energy credits (RECs) and attempts to change federal tax rules. After nearly eight years of work, the Rosebud Sioux Tribe of Rosebud, South Dakota, inaugurated the Alex Little Soldier Wind Turbine-the United States' first Native American-owned and operated commercial wind turbine-in February 2003. The 750-kW NEG Micon turbine produces about 80 percent of the electricity needed by the Rosebud Casino and Hotel. Basin Electric Power Cooperative in Bismarck, N.D., purchases excess electricity, which is delivered through a cooperative effort with Nebraska Public Power, Basin Electric and the Western Area Power Administration. As part of the financing package, NativeEnergy LLC purchased renewable energy certificates-also called green tags or renewable energy credits-from the project. The purchase amounted to about 25 percent of the project's $1.2 million overall cost and was instrumental in the tribe's success, says NativeEnergy president and chief executive officer Tom Boucher. The company then resold them on the open market. The Department of Energy and the Rural Utilities Service financed the remainder of the project with a grant and low-interest loans. Boucher says NativeEnergy typically looks for projects that would otherwise not be built without the firm's involvement. "We commit to help particularly small projects that don't have the access to the economies of scale, where you don't have the Florida Power and Lights or the deep pockets to build the projects," he says. "We're always looking for extra social value beyond the environmental benefits. That is why we focus on tribes, on family farmers and on community-based projects." The Alex Little Soldier Turbine was so successful that the Rosebud Sioux Tribal Utility Commission is putting together a financing package to build the 30-MW Owl Feather War Bonnet Wind Farm featuring 18 turbines near St. Francis, S.D. Although the project will have outside investors, Boucher says NativeEnergy's board decided to stay involved because of the long-term benefits the tribe will realize. "The community is going to get significant benefits from placing the turbines on trust land and receiving ongoing lease payments, which, based on what we know, are probably some of the highest available in the country," Boucher says. "They've even created a trust to benefit the tribe." The help-build REC program that NativeEnergy has developed works like this. NativeEnergy determines the energy output potential over a proposed project's life using industry-accepted formulas. Each REC represents one MW hour of renewable energy. A third party, the Climate Neutral Network of Colfax, California, audits the REC estimates. NativeEnergy then sells the RECs based on a discount formula that helps reduce inherent risks. Although the credits represent output during the project's life, the proceeds are delivered up-front as soon as project construction is completed. Typically, the payments represent 15 percent to 25 percent of the project's overall costs, Boucher says. On the Kumeyaay project, the Campo Tribe leased about three square miles to project developers for the 25 two-MW Gamesa turbines. In return, the 300-member tribe receives annual royalties equivalent to five percent of the electricity sales. NativeEnergy was formed in 2000, and the non-profit Intertribal Council on Utility Policy (COUP) of Rosebud, S.D., became a majority shareholder in August 2005. The Intertribal COUP council has representatives from nine northern Great Plains tribes in South Dakota, North Dakota, and Nebraska. "We're trying to build a company that is very sound from a business perspective and has the tribal ownership associated with it so we can bring some of that equity to the tribes," Boucher says. "Some of the poorest tribes in the country have the best wind resources." The Intertribal COUP is developing an 80-MW intertribal wind energy project on six reservations. The council plans to develop a 10-MW project on each of eight reservations to serve local markets and Western Area Power Administration power purchase contracts. The projects will be owned by each tribe, but marketed and managed under an intertribal business structure. To date, the 50-MW Kumeyaay Wind Project, located on Tecate Ridge about 60 miles east of San Diego, California, is the largest wind-energy project on tribal land. Unlike the Alex Little Soldier Turbine, which involved tribal ownership, the Campo Tribe of the Kumeyaay Nation leased about three square miles to project developers on which to situate the 25 two-MW Gamesa turbines. In return, the 300-member tribe receives annual royalties equivalent to five percent of the electricity sales to San Diego Gas and Electric, according to Department of Energy reports. The project was originally developed by Superior Renewable Energy LLC of Houston, Texas, which was sold to Babcock & Brown Renewable Energy Holdings, a subsidiary of Sydney, Australia-based Babcock & Brown, in August 2006. In addition to Babcock & Brown, which maintains substantial equity in the $51 million project, G.E. Financial Services of Stamford, Connecticut, was an investor. 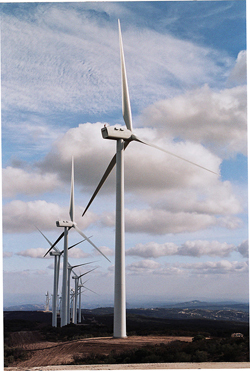 EnXco Services Corp. of Tracy, California, manages and maintains the wind turbines. Since initial planning began, it took about 2-1/2 years to complete the project, which isn't out of line with comparable projects, says John Calaway, who was chief executive officer with Superior Renewable Energy. He now heads wind energy development for Babcock & Brown in Houston. What was different is how the project had to be approached. "In the case of the Campos and most Indian tribes, you are dealing with a sovereign nation," Calaway says. Calaway initially discussed the project with the tribal chairman to see if the tribe would be interested, a process that involved monthly trips to California to meet with him and eventually the tribal council. "This is not something you do with e-mail," he says. "This is a very sensitive thing when you start talking about tribal land. This is where the community holds on to their heritage and history." Because Native American tribes are considered sovereign nations, they do not fall under U.S. law. "One of the most complicated and tricky parts was dealing with the limited waiver of sovereign immunity to finance the project," Calaway says. "It is one of the most sensitive subjects, because sovereign immunity is critical to the tribe. But in the case of the Campos, they had experience financing other projects. It was extremely narrowly defined just to the wind project." Once the tribal council approved the project, it then had to be approved by the full tribe. Different tribes have different rules. With the Campo Tribe, at least 50 percent of tribal members had to vote on the proposal. "We had very strong support from the chairman," Calaway says of the unanimous outcome. "At that point, you have agreement with the tribe. If that was all you had to do, that would be great." The next step involved seeking approval from the U.S. Bureau of Indian Affairs and its real estate, environmental and cultural divisions. Because the Kumeyaay project was the first commercial wind development to be built on tribal lands, Calaway says the bureau had no precedent to which to refer. Superior Energy had to prepare an environmental assessment that examined the project's impacts on the region's culture, archeology and biology. A third-party appraiser also had to analyze the deal to ensure the royalty payments were consistent with market rates. Each time a government agency recommended substantial changes to the project, Calaway had to return to the tribe's executive committee to obtain approval. 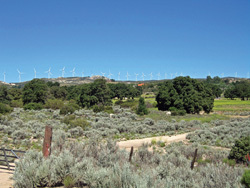 The Campo Tribe is currently exploring building a 20-MW turbine project nearby, says Mike Connolly, a tribal councilman. But tribal members are waiting to see what Congress does as it debates renewal of the Energy Policy Act. First enacted in 1992, the act provides tax credits to producers of renewable energy. Tribes and other non-profit entities are ineligible, which is a disincentive for them to develop wind energy, he says. Connolly says the Campo Tribe as well as other tribes would like to see that changed so they could receive the tax credits and have a valuable asset with which to negotiate with energy developers. Upon completion of a deal, the tribe could transfer the credits to the developers. "We don't know how far this will go this time, but we're trying to push this," he says. "This is one of the biggest obstacles to wind energy development." Further ahead is a project to install one or two turbines that would produce two MW of electricity, equivalent to about 90 percent of what the tribe's newly expanded casino and hotel uses, Connolly says. But the California Public Utilities Commission limits the size of turbines that can feed into the grid through its net metering program to one MW. "That would force us to do two one-MW turbines rather than have the efficiency of one two-MW," he says. "We're talking with the state to get them to change that rule to allow up to five MW." The tribe also is pushing for changes to net metering rates. Currently, generators who feed electricity into the grid receive a flat rate, regardless of the time of day. The tribe would like higher payments for energy generated during the peak use times of 4 p.m. to 7 p.m."If we can store power and get a premium rate, it makes up for some of the losses of energy from the storage," Connolly says. "It may be a better system than to go straight into the grid."